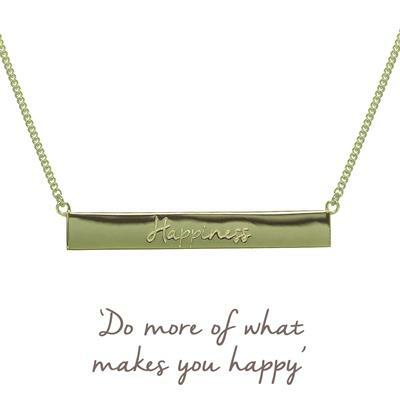 The Happiness Bar Necklace is made from Gold Plated 925 Sterling Silver and hangs horizontally on a silver chain, with the word 'happiness' inscribed onto the bar. The iconic Mantra lotus symbol decorates the reverse. Presented on a beautiful card to keep, with an inspiring image on the front, and space on the back for your personal message. A mantra is a powerful phrase, intended to make a positive impact on the way that we feel. Repeat your mantra to inspire yourself. It will give reassurance and comfort, as well as motivating and energising you. Hold onto your piece of jewellery, and repeat its mantra to yourself several times a day. Packaging: This Mantra comes packaged in a gift box with its meaning card.